NHS Lothian has recorded the worst performance for A&E waiting time targets since the publication of weekly figures began almost three years ago. The collapse in its figures follows an admission its acute hospitals had previously "under-reported" waits. In the latest weekly figures, just 77.3% of patients were dealt with within the four-hour target. Before the misreporting came to light in October the health board had been meeting the government's target of 95%. At the beginning of 2015, the Scottish government began publishing A&E waiting times every week as a response to concerns about poor performance in some health boards. BBC research published last week showed that over the past three years Scotland's A&E departments were the best performing anywhere in the UK. It showed that Scotland had maintained its performance as England's figures had slumped. However, a question mark was raised over how NHS Lothian reported its figures and it was found to have breached guidelines. The health board has now recorded the worst figures for a health board since weekly reporting was brought in. It missed the four-hour target for almost a quarter of all patients attending A&E. The Royal Infirmary of Edinburgh had the poorest performance of any hospital in Scotland, seeing less than two-thirds (64.1%) of patients on time. 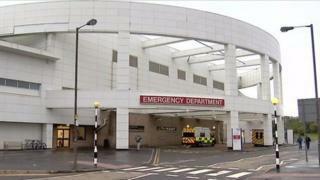 Lothian's other general A&E fared better at 86.6%. Overall, Scotland's accident and emergency departments recorded their worst performance since March 2015. The figures for the week ending 10 December showed that 86.9% of patients were dealt with within four hours. NHS Forth Valley (83.4%) and NHS Greater Glasgow and Clyde (84.9%) reported figures well below the 95% target. Health Secretary Shona Robison said outbreaks of flu and slips and trips because of black ice had led to extra pressure on hospitals in recent weeks. She said the Scottish government was working with NHS Lothian to help tackle waiting times and delayed discharges at the Royal Infirmary of Edinburgh (RIE) by "helping identify specific issues and providing solutions". NHS Lothian's deputy chief executive, Jim Crombie, said: "Like a number of other health boards, NHS Lothian is experiencing significant winter pressures across our whole healthcare system. "There are a number of contributing factors, including the increasing complexity of cases presenting at emergency departments and significant numbers of delayed discharges. "This new way of working will allow us to zoom in on processes and procedures, not just in the emergency department, but across the acute care system to help improve patient flow through our hospitals."